Pioneers in the industry, we offer armoured power cables from India. We make available an excellent assortment of Armoured Power Cables, which is offered at industry leading prices. 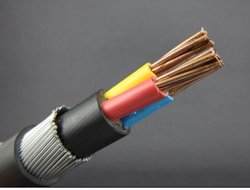 These cables are mainly used in the underground cabling and connections in control panels of electric control circuits. Also, we source the raw materials of armored Cables from the authentic and certified vendors of the industry. Moreover, the demand of these cables is increasing day by day for their superior quality.